The Cotswolds seem to be a fashionable setting for murder and mayhem these days. However MC Beaton was probably the founder of that trend with her novels featuring the brusque, sometimes annoying but ultimately insecure and naïve Agatha Raisin. Published in the US for over a decade, this series is finally available in the UK. 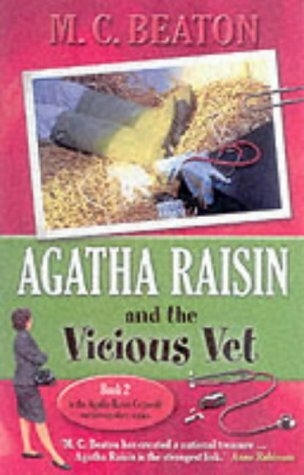 AGATHA RAISIN AND THE VICIOUS VET is the second in the series and finds Agatha more, but not completely, settled in her idyllic Cotswold cottage, bought after she took early retirement from her own PR company. Her romantic pursuit of her new neighbour, the dashing James Lacey, isn't going too well but she begins to realise that less is more and that backing off the romance aspect increases her chances of friendship. Her mind is turned from Lacey when a new veterinary practice is set up in the village, run by an attractive vet, Paul Bladen. Along with the rest of the women in the village she trumps up an excuse to take her pet, in her case a cat, along for examination. Though the surgery is full on her visit, it's not long before discontent with the new vet circulates through the village and business tails away. Apparently Bladen prefers the larger animals and has little interest in cats and dogs, and it shows. Nonetheless, Agatha is rather pleased to have a date with the vet in a nearby town where he tells her of his plans to build a large animal hospital and how he is seeking funds. Though Agatha is happy to offer a small donation she's less than taken with the vet and his idea of a romantic night out. The next day, Bladen is dead, found in the stables of the local Lord of the manor. The police consider it an accident as he appears to have fallen on a syringe of medicine intended for a horse, but Agatha thinks differently. She and Lacey team up to investigate further. This is a delightful amateur sleuth series from the author of the PC Hamish Macbeth books and they make great comfort reads. There is a suitably complex plot and some character development with Agatha beginning to adapt to life in the country and to being less self centred as well as refining her methods of ensnaring Lacey. One of the standout characters is a local policeman called Bill Wong who becomes her friend and adviser. There are some memorable and funny scenes in this book including a dreadful meal made by Bill's parents. With the 13th book in the series due out in the US in March (2003), let's hope the UK publishers bring out more than one a year.